The world of photography plays an important role in the way people understand things. Through visual power, photographs have the power to convey a message within the context in which the photograph is taken. As such, photographers exploit the visual power of photography to advance their ideologies in a way that appeals to the audience. Taken in isolation, photographs cannot have meaning but they obtain their meaning from the photographer puts them in the context within which they are taken. Thus, the photographer’s perspective on the focus of the photograph contributes to the construction of the photographic meaning and subsequent understanding that the viewers are likely to associate with the photograph (James, Heath & Lapp, 12). The purpose of this paper is to compare and contrast two photographs with a view of exploring the differing perspectives of the photographers and how these perspectives contribute to the construction of the photographic meaning. The two photographs to be compared and contrasted in this paper deal with the subject of social documentation. The first photograph was taken in the United States while the second was taken in Kenya. The two photographs are comparable in the way they capture the theme of tourism as a social activity dominant in different cultures. The two photographs captures the scenic environment in which the people are touring in detail. The photographers focused their camera to capture the horizon of the environment in which the main features are captured. While the focus is on the people in the image, the view is expanded to capture other details that demonstrate the environment in which tourists are in. In both the photographs, the sky is captured to give a glimpse on the weather that is attractive and appealing to tourists. Both photographs have groups of people who are apparently interested in something of common interest. As noted by Mirzoeff (20), photographs usually capture the details that the photographer want included in the picture. Thus, they must be taken from a position that captures the intent and objectives of the photographer. In photographs, the intent and objective of the photographers was enabling the audience to have a glimpse of the environment in which people can enjoy themselves while doing interesting activities. The surrounding and the environment are important elements especially in photographs that seek to attract people to visit a particular site. In both photographs, the people involved are immersed in the activities that unite them. In the first photograph, a group of young people are relaxing beside an ocean and engaged in talking with each other. 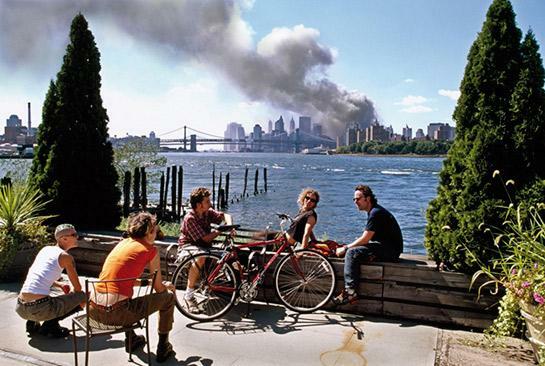 We can see that the conversation among the group is taking place in an environment that is relaxing although there is smoke coming from a building behind them. 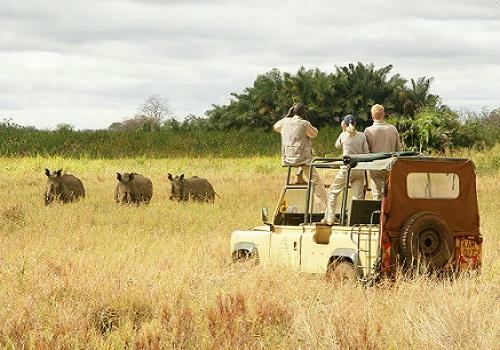 In the second photograph, three people, apparently tourists are in a national game reserve on a tourist’s vehicle and cameras, taking photos of wild animals in the national reserve. The people in the first photograph have bicycles which mean that the site is suited for use of bicycles. In the second photograph, the people are using a vehicle to protect them from being attacked by wild animals (James, Heath & Lapp 32). In the first photograph, the sky is clear with little clouds while in the second photograph the sky is covered with clouds, a demonstration that the environment in which the photograph was taken experiences heavy rainfall, which might contribute to the presence of wild animals in the park. While in the first photograph, the audience is led into the other social activities that take place in the surrounding, in the second photograph, the photographer only reveals one activity. In the former photograph, we can see bile of smoke coming out of a building, probably an industry. The presence of smoke in the photograph serves an important point to interpret the context in which the photograph is taken. In the same way, the presence of wild animals in the second photograph demonstrates the context in which the photograph was taken as being in a national park. One of the outstanding features of the two photographs is the capture of the background. The two photographs focus equally on the background detail while giving the viewer an opportunity to see the center of focus in light of the background. The use of background as an element of photography is important in contextualizing the photograph by giving the viewer a glimpse of what is happening in the background and allow them to judge or make interpretations of the photograph based on the images captured in the background. Since the two photographs were demonstrating the concept of tourism, it was important for the photographers to capture a wider view of the background with the horizon and the clouds to situate the pictures in a context of enjoyment and relaxation. The presence of wild animals in the second photograph, in the background, also reinforces the idea of touring a national park where animals are living in their natural environment (Tormey 80). Balance in photography is an important element that gives photos a sense of asymmetry of symmetry. In the first photograph, the photographer attains balance by allowing two trees to appear on the side of the photograph (Roberts 45). In the second photograph, the balance is asymmetrical since the vehicle is on one aside and the wild animals on the other side. The elements in the photograph have different visual weights and looking at the photograph immediately elicits the feeling of asymmetrical balance in the picture. In both the photographs, the center of interest seems to be the distributed environment behind the people in the photograph. Most photography analysts argue that the center of interest in a photograph should not be located at the center of the photograph as this is boring and static. The two photographs distribute the center of interest from the central place and locate at the horizon of the photos. The viewers’ eyes are forced to move across the photos as the images are not located at the center and in process the whole theme is captured. While in the first photograph the photographer utilizes the elements of curves, lines and shapes to create a sense of direction and link objects in the frame, the second photograph does not utilize these elements and therefore difficult to determine any direction in the photograph (Ben-Amos & Weissberg 27). In the first photograph, there is smoke moving in a given direction and one can see the lines in the water to demonstrate movement of waters in the pool. The elements that define direction and orient viewers are essential in helping them to determine where the actions start and where they end. In the first photograph, a viewer can easily predict the start of the action such as movement of water and movement of smoke. However, in the second photograph, the viewer cannot tell direction and therefore difficult to determine where actions begin and end in the photograph. A point of similarity between the two photographs is the camera distance that the photographers use to capture the images on their camera. In the two photographs, the camera distance seems to be the same, which allows the photographs to capture as much details as possible in the two photographs (James, Heath & Lapp 35). Camera distance is an important element in photography because varying it affects not only the details that are captured in the photograph but also the subject and central image in the photograph. While in the first photograph the subject seems to be close up in the second they are distributed in a far distance. The vast area is included in the frame of the second photograph than it is in the first photograph. This however, does not inhibit the capture of the foreground and background details in the two photos. Lighting in photography is used to create a sense of texture and mood (Mirzoeff 38). The natural light in the first photo which cast shadows of trees and people creates mood of the photograph. A viewer can see that a group of young people is sitting beside a pool probably on a sunny afternoon. The element of light is also emphasized in the first photograph where the shadows of the images are shown among the details in the photo. In the second photo, light is reduced. In the second photograph, it is difficult to tell the time of the day when the photograph was taken because light is not so much utilized to give texture or mood in the picture. From the analysis of the two photographs, it is evident that they both have areas where they are similar and different. However, the two capture a theme where people are relaxing in two different environments. The photographs use a number of photographic elements such as use of balance, symmetry and camera distance to define the important elements that they capture in the photographs. A similarity between the two photographs is that both uses almost the same camera distance to capture the images and the horizon of the environment in which the activities tale place.